Shutter pins are utilized when constructing new plantation shutters. These shutter pins support the louvers in the shutter panel, and allow the louver to rotate. 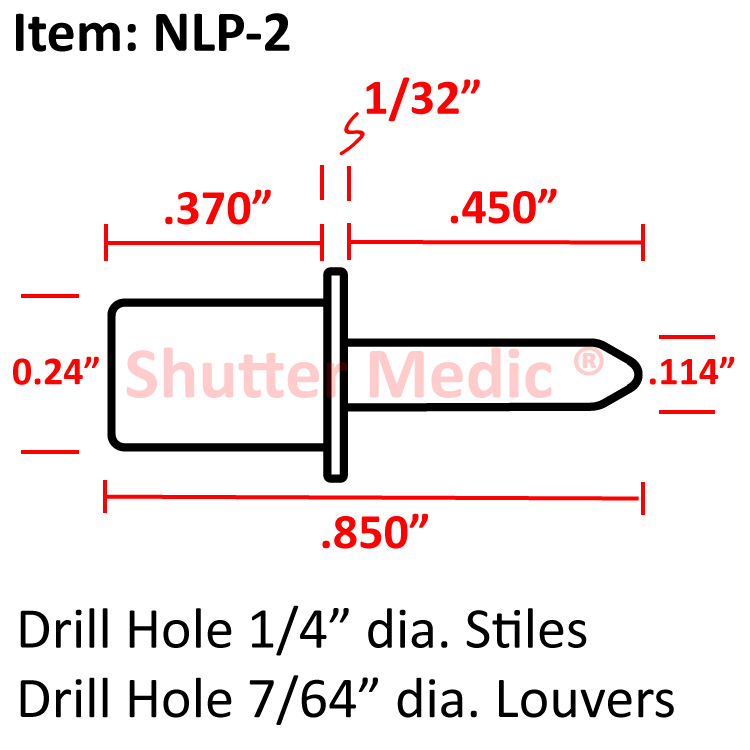 The narrow end of the shutter pin is smaller than the standard nylon louver pin NLP and is inserted in the same manner into the louver requiring a 7/64 inch diameter hole.. The larger end of the shutter pin is inserted into the stile or frame. A washer is molded into the shutter pin which prevents the louver from rubbing the inside of the shutter stile allowing for smooth operation of the louvers. The larger end of the shutter pin that is .240 inches in diameter is inserted into the Stile. A 1/4 inch diameter hole is required in the Stile.